What Is a CrossFit Total Workout? The overhead press is part of a CrossFit Total workout. The CrossFit Total is a workout program that develops and measures functional weightlifting strength. 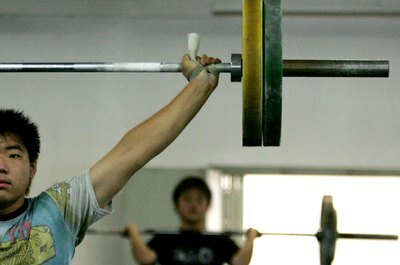 The program contains three barbell lifts and is similar to a powerlifting competition, with two lifts in common -- the deadlift and the squat. But instead of a bench press, the CrossFit Total uses a standing press. The format can be used as a competition, or you can employ it on your own, as a workout, to test your functional strength. Whether you’re competing or working out, the CrossFit Total includes three attempts at each of the three lifts. You begin with the squat, followed by the press and the deadlift. The heaviest weight you lift in each category counts as your score, then the three scores are added, resulting in your CrossFit Total score. Each official attempt that counts toward your score begins when you unrack the barbell. Once you begin a lift you may not stop your upward motion. You can rest as long as you like between official attempts for each lift, but you cannot sit, take a drink or leave the workout area until you’ve completed your three attempts for that category. Warm up before you begin a CrossFit Total workout, just as you would for any strength-training session. Perform some light aerobics followed by dynamic stretching to warm and loosen your muscles. Do several warm-up attempts for each category, based on your plan for that type of lift. For the squat, for example, load the barbell with the same weight you normally use when you warm up for a standard squat workout, and do about five repetitions. Do around five more warm-up sets or lifts, adding more weight each time, until your final warm-up attempt is about 90 percent of the weight you plan to lift for your first official attempt. If you wish, you can reduce your warm-up time for the press, because the squat provides a good overall warm-up. You can reduce your warm-up even further before attempting the deadlift. Begin your official three-lift set with a weight you’re sure you can lift three times. This gives you a safe lift and helps you progress further on your next two attempts. Choose weight that you’re certain you can lift once for your second attempt. This will likely be a bit lighter than your previous one-rep maximum. After two successful lifts, try for your target weight on your final attempt. Depending on how you feel, and how well you’ve trained, the third lift may go beyond your previous one-rep max. Don’t attempt the CrossFit Total if you don’t know your one-rep max. Because your warm-up and lifting schedules are both based in large part on your previous best lift, you risk sustaining an injury if you overestimate your ability. Even if you know your one-rep max and you plan your workout properly, listen to your body. Stop the workout if you feel abnormal pain, or adjust your plans and lift lighter weights if your early lifts are more difficult to complete than you anticipated. Spotters aren’t permitting during official competitions, so be prepared to drop the barbell on the floor if you’re in duress while lifting. What Is the Difference Between Strength Training & Weight Lifting?